For the first time since 2010, Franklin Avenue, between Hardin and Main Streets, came alive with people. 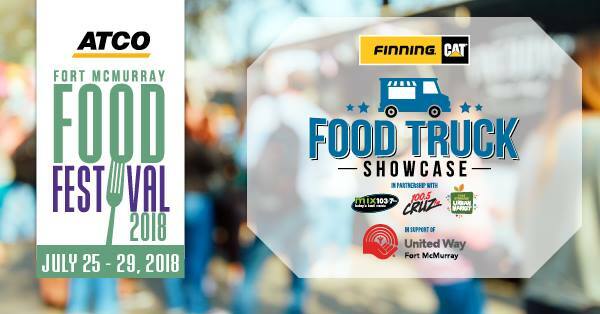 The YMM Food Festival's Food Truck Showcase cordoned off the block at midnight to allow time for tents, staging, porta potties and food trucks to be rolled in for the Food Truck Showcase. The last time the street closure happened was in 2010, which was the 20th anniversary of interPLAY Festival. Heather and I stood in a line for about an hour to get food over the lunch hour. It is true. One of the knocks of the Food Truck Showcase was that there wasn't enough food trucks to meet the demand. Several companies that has said they were going to participate didn't show up. It happens. I enjoyed standing in the line, watching the street teeming with activity. I enjoyed seeing people who I hadn't seen in a long time. I enjoyed the vibe of being in the middle of a street festival on the block that I became so familiar with volunteering for 15 interPLAYs. 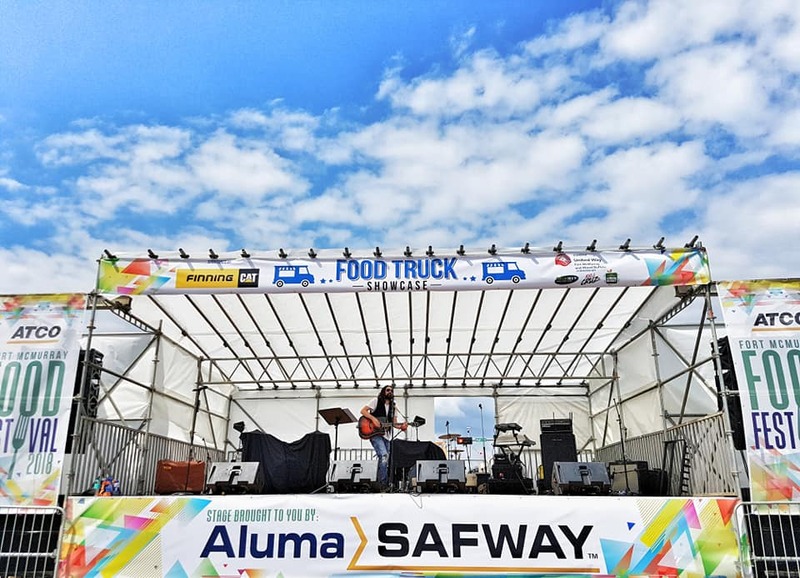 The Food Truck Showcase was the opening evening in the 5-day YMM Food Festival. It was a fundraiser for the United Way of Fort McMurray and Wood Buffalo. It was held in conjunction with the Urban Market which was happening in the adjacent Jubilee Plaza. It turned out to be a good marriage. According to my wife, it was the busiest she had seen it in a long time. She likes to attend to pick up farm fresh produce and eggs. I hope the organizers are happy with the results. 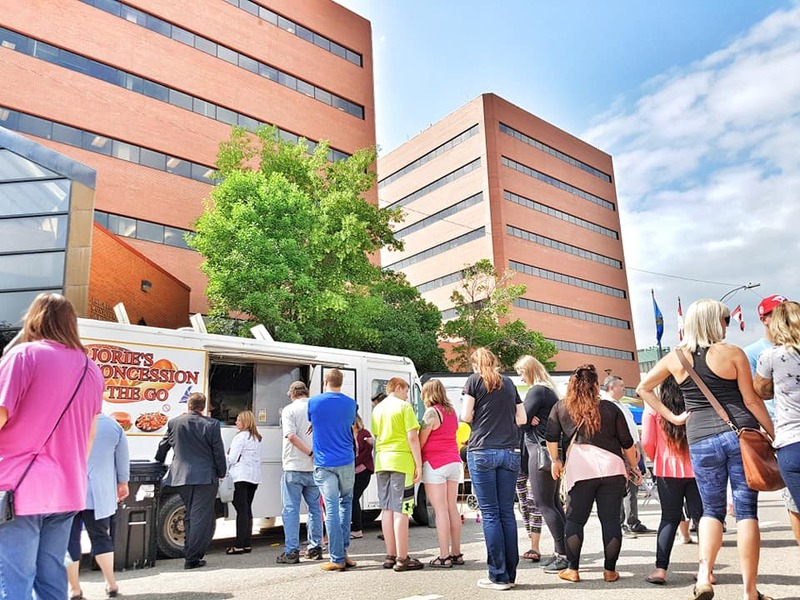 The Food Truck Showcase was well attended and created a lot of smiles. I went back to see how things were going in the evening. People were still getting food, but the energy had shifted to the beer garden and stage area as the headliners filled the air with rock music. My son Dylan stayed for the closing act. It was busy when I was there. He shared that it got even busier as the closing act hit the stage. "It was packed," he said. It takes a lot of energy, time and commitment to get a festival like this up and running. Looking at the pamphlet they handed us when we arrived, a lot of companies and volunteers stepped up to make it happen. Congratulations to all concerned. Add a few more street performers and children's activities; through in some more music and theatre, and you've got something closely resembling interPLAY. There is a lot more to come. You can check out everything by clicking here.